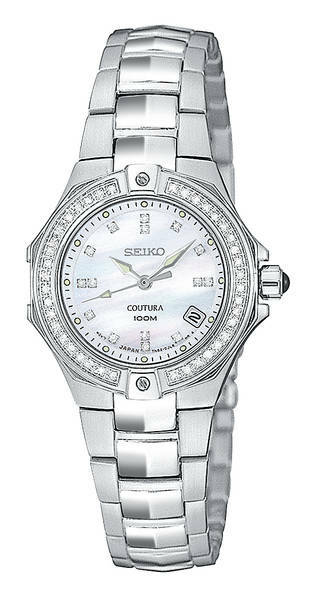 This elegant Ladies watch with a white Mother-of-Pearl face is highlighted by 55 diamonds set around the bezel & as the markers. A stainless steel case & band with partial brushed finish completes the look; a sapphire cabochon in the crown adds another touch of distinction.. A small window on the watch face displays the day of the month. The link band is long lasting and comfortable to wear.